actor Ronald Colman (below) was born in England. Following an impressive (mainly US) film career he starred (with his wife Benita Hume) in the popular radio show, The Halls of Ivy, which transferred briefly to television. 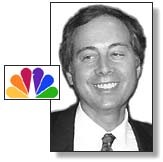 He also was the urbane host of radio’s widely-syndicated Favorite Story. He died May 19, 1958 of a lung infection at age 67. On this day in 1901, actor Brian Donlevy was born in Cleveland. Most of his productive years were on stage & the big screen; on TV (and NBC Radio) he starred in the 50’s action series Dangerous Assignment, plus dozens of guest roles. He succumbed to throat cancer Apr. 5, 1972 at age 71. On this day in 1902, radio actor Chester H. Lauck was born in Allene Arkansas. With fellow Arkansan Norris Goff he would create one of radio’s alltime favorite programs, “Lum & Abner,” hillbilly proprietors of the “Jot ‘Em Down Store” in Pine Ridge Arkansas. Their idea was a switch on Amos ‘n’ Andy. He died Feb. 21 1980, 12 days after his 78th birthday. On this day in 1914, Country Music Hall of Famer Ernest Tubb was born near Crisp Texas. He remained a regular on the Grand Ole Opry radio show for 4 decades, and headlined the first Opry broadcast from Carnegie Hall. He died of emphysema Sep 6, 1984 at age 70. On this day in 1955, the No. 1 Billboard Pop Hit was “Sincerely” by The McGuire Sisters. On this day in 1957, “Don’t Forbid Me” by Pat Boone topped the charts .. but only stayed on top for a week. On this day in 1958, the CBS Radio Network first aired “Frontier Gentleman” starring John Dehner. The classy western production came too late in the radio era to achieve the success it deserved. Also this day in 1958, the American Research Bureau stated that “American Bandstand” was the number one daytime TV program. On this day in 1959, six days after the fatal Iowa plane crash on “The Day The Music Died,” substitute headliner Frankie Avalon contracted pneumonia and left the tragedy-plagued Winter Dance Party tour, to be replaced by Paul Anka and Fabian. On this day in 1961, The Beatles appeared at the fabled Cavern Club, Liverpool, for the very first time (as The Beatles). They would go on to make a total of 292 other appearances at the Club. On this day in 1962, Neil Sedaka was in RCA Victor’s Studio A in New York City to tape his original uptempo version of “Breaking Up is Hard to Do.” It hit #1 that August. It was a hit a second time for Sedaka after he recorded a slower ballad version in 1975. On this day in 1963, the song “Hey Paula” by Paul & Paula topped the charts and stayed there for 3 weeks. On this day in 1964, the Beatles made the first of three record-breaking appearances on “The Ed Sullivan Show”. The audience viewing the Fab Four on CBS TV was estimated at 73,700,000, The Beatles sang “She Loves You” “All My Loving,” “Till There Was You,” “I Saw Her Standing There” and “I Want to Hold Your Hand”. The songs were barely audible above the screams of the girls in the theatre. Also this day in 1964, singer & bandleader Willie Bryant, who was a regular on the 1949 TV series Sugar Hill Times, died at age 55. On this day in 1966, Liza Minnelli brought her night club act to the Big Apple. She opened in grand style at the Persian Room of the Plaza Hotel in New York. On this day in 1969, [George] Gabby Hayes, western sidekick in scores of movies & on the radio, and the star of two TV series (The Gabby Hayes Show) in the 50’s, died of a heart ailment at age 83. Also this day in 1969, 18-year old Roslyn Kind made her quiet TV debut this night on “The Ed Sullivan Show.” Ed said she was “….America’s teenager who wasn’t protesting or playing a guitar.” She only appeared on the Sullivan Show the one time. Her sister appeared many times. Roslyn Kind is the younger sister of Barbra Streisand. On this day in 1970, Sly and The Family Stone received a gold record for the single, “Thank You (Falettinme Be Mice Elf Agin)”. Sly (Sylvester) Stewart was a DJ in Oakland, Calif.
Also in 1970, the LP “Bridge Over Troubled Water” by Simon and Garfunkel was certified as a Gold Record, having sold more than 500,000 copies. Also in 1972, Paul McCartney and his new band Wings gave their first public performance in a surprise appearance at England’s Nottingham University. On this day in 1974, Toronto columnist/broadcaster Gordon Sinclair‘s recording of his radio commentary, The Americans (A Canadian’s Opinion) peaked at #24 on the pop singles chart. Also this day in 1974, the song “Love’s Theme” by the Love Unlimited Orchestra topped the charts .. but only for a week. On this day in 1976, Toronto-born conductor Percy Faith died of cancer aged 67. He scored the 1953 hit ‘Song from Moulin Rouge (Where is Your Heart)’ and 1960’s ‘Theme From A Summer Place’, which spent nine weeks at No.1, and won the Grammy’s Record of the Year in 1961. On this day in 1976, the No. 1 Billboard Pop Hit was “50 Ways to Leave Your Lover” by Paul Simon. The song was Simon’s first No. 1 single since ending his 13-year partnership with Art Garfunkel in 1970. On this day in 1979, K-Mart pulled Steve Martin‘s comedy album “Let’s Get Small” for being in bad taste. Also in 1979, a UK band called UB40 played their first gig at a pub in their hometown of Birmingham. The Reggae group’s unusual name comes from the signing-on document issued to people claiming unemployment benefits from the British government at the time. On this day in 1981, Bill Haley was found dead, fully clothed on his bed at his home in Harlington, Texas from a heart attack & a brain tumour at age 55. Haley, with his Comets, recorded the so-called anthem of rock and roll: “Rock Around the Clock”, from the movie, “Blackboard Jungle”. On this day in 1983, Prince‘s recording of “Little Red Corvette” was released, soon becoming his biggest hit to date. On this day in 1990, Nirvana set out on a short west coast tour, opening for Dinosaur Jr. at the Pine Street Theater in Portland. On this day in 1993, actress Kate Wilkinson, who had recurring roles on the soaps Guiding Light & Another World, died of cancer at age 76. Also this day in 1993, Mick Jagger released a solo album called “Wandering Spirit.” The same day, Paul McCartney released his solo album, “Off The Ground” in the US. On this day in 1994, Chinese New Year’s Eve, Memory Music CHQM 1320 ended its over 34 years of nostalgic and easy listening music at 9 pm with Bob Hope’s “Thanks for the Memories.” After a brief pause CHMB 1320 signed on with an all night Chinese program. This new multilingual format continued for about 7 months before becoming ALL Chinese Monday-Saturday. CJVB 1470 would follow suit. Also this day in 1994, the 100th episode of “Beverly Hills 90210” was aired on FOX. On this day in 1995, actor David Wayne died of lung cancer at age 81. Although essentially a bigscreen character actor, he did have recurring TV roles in Dallas, St. Elsewhere, Matt Houston, Batman, House Calls, & Ellery Queen. On this day in 1997, “The Simpsons” became the longest-running prime-time animated series as they eclipsed the mark set 30 years earlier by “The Flintstones”. On this day in 1998, Oprah Winfrey‘s guest Garth Brooks agreed to donate his earnings from sales of his current album “Sevens” for a seven-day period to “Oprah’s Angel Network.” The donations went toward funding college scholarships for students in need. On this day in 2001, after being terminated by the Eagles, guitarist and original member Don Felder filed a $50 million lawsuit against guitarist Glen Frey and drummer Don Henley, alleging wrongful termination and breach of contract. Also this day in 2001, the UK alternative rock band Coldplay made its U.S. debut at Seattle’s Showbox Theatre. On this day in 2004, at 5 a.m. MOJO Radio 730 dropped its “Talk Radio for Guys” to become Vancouver’s 2nd all-sports radio station with the slogan “Just Sports”. For the next 6 months most of its programming would originate from ESPN Sports Radio. Also in 2004, singer Diana Ross began serving a two-day jail sentence for an Arizona drunk driving conviction at the police station near her luxury home in Greenwich, Connecticut. Tests during her arrest 13 months earlier revealed she had a blood-alcohol level of 0.20 percent, two-and-a-half times Arizona’s legal limit of 0.08. On this day in 2005, The Who singer Roger Daltrey was awarded the CBE by The Queen for his services to the music industry. On this day in 2006, Canada’s premier leader of the big band era, Mart Kenney died after a long illness in Mission, B.C., at age 95. From 1934 to 1947 he had a weekly national radio broadcast of dance music, first from Vancouver and later Toronto. On this day in 2007, Scottish-born film and TV actor Ian Richardson died in his sleep after a heart attack at age 72. Richardson played the evil Francis Urquhart in 3 TV miniseries House of Cards (1990), To Play the King (1993) and The Final Cut (1995). On this day in 2008, The Band were honored with the Recording Academy’s Lifetime Achievement Award. They were saluted at an invitation-only ceremony the night before the Grammy Awards. On this day in 2010, chain-smoking crab fishboat captain Phil Harris, a star of the Discovery Channel’s reality TV show The Deadliest Catch, succumbed to heart difficulties at age 53. Still in 2010, 67-year old Barbra Streisand turned down a 100 million dollar offer to headline at a Las Vegas showroom for three years. 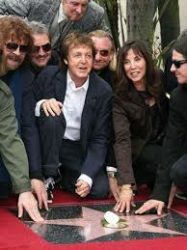 On this day in 2012, Paul McCartney was on hand to help unveil his star on the Hollywood Walk of Fame, thus becoming the last of the four Beatles to be singularly honored. McCartney’s star is found near the Capitol Tower, Capitol having been the Beatles’ main label in North America. On this day in 2014, “The Night That Changed America: A Grammy Salute To The Beatles,” was broadcast on CBS to mark the 50th anniversary to the day of The Beatles debut appearance on the Ed Sullivan Show. On this day in 2015, Ed Sabol, the innovative founder of NFL Films who helped change the way North Americans watched sports on television, died at his Scottsdale, Ariz. home at age 98. He was inducted into the Pro Football Hall of Fame in 2011. On this day in 2017, veteran BC radioman Rudy Hartman died of respiratory difficulties at age 99. His career began at CJAT in his hometown Trail B.C., took him to CJVI Victoria, to service in WWII, then to CKLG and CHQM Vancouver, CFMS Victoria and finally CJVB Vancouver where he was GM. On this day in 2018, actor Reg E. Cathey, blessed with a distinctive baritone voice, who played Freddy on “House of Cards” and appeared in “The Wire” and “Oz,” died after losing his battle with cancer at age 59. Retired TV newsman Roger Mudd is 91. Actress Janet Suzman (Masterpiece Theatre) is 80. Singer/songwriter Barry Mann is 80. Actress-turned-politician Sheila James Kuehl (The Many Loves of Dobie Gillis) is 78. Singer Carole King is 77. Actor Joe Pesci (Half Nelson, Pink Panther) is 76. Actress Mia Farrow (Third Watch, Peyton Place) is 74. Actress Judith Light (Transparent, Doubt, Ugly Betty, Dallas 2013, Who’s The Boss, Law & Order:SVU) is 70. Actress Penny Peyser (Knots Landing, Crazy Like a Fox, The In-Laws) is 69. Saxophonist Dennis “DT” Thomas of Kool and the Gang is 68. Actor Ciaran Hinds (Game of Thrones, Rome) is 66. Actor Jim J. Bullock (Too Close for Comfort, Ned’s Declassified School Survival Guide, The Bold & the Beautiful) is 64. Actor Charles Shaughnessy (The Nanny, Saints & Sinners) is 64. Actor Ed Amatrudo (Nashville) is 63. Sax player Steve Wilson is 58. Actress Julie Warner (Crash, Nip/Tuck, Family Law) is 54. Actor Darren Dalton (The Best Times) is 54. Ontario-born actor James Gallanders (The Kennedys, The City) is 49. Actress Isabel Gillies (Law & Order: SVU) is 49. Actress Sharon Case (The Young & the Restless, Valley of the Dolls, As The World Turns) is 48. Actor Jason George (What About Brian, Off Centre, Sunset Beach) is 47. Actor Colin Egglesfield (All My Children, Melrose Place, The Client List, Rizzoli & Isles) is 46. Actress Amber Valletta (Revenge) is 45. Actor Corey Parker Robinson (The Wire, Guiding Light) is 44. Actor-producer Charlie Day (It’s Always Sunny in Philadelphia) is 43. Singer Chad Wolf of Carolina Liar is 43. Irish-born Canadian actor A.J. Buckley (CSI: NY) is 41. Actress Gloria Votsis (White Collar) is 40. Actress Margarita Levieva (The Deuce, The Blacklist, Revenge) is 39. Actor Tom Hiddleston (The Night Manager) is 38. Actor Matty Cardarople (Selfie) is 36. Actor David Gallagher (7th Heaven) is 34. Actress Rachel Melvin (Days of Our Lives) is 34. Actor Michael B. Jordan (Parenthood, Friday Night Lights, The Wire, All My Children) is 32. Actress Rose Leslie (Game of Thrones, Downton Abbey) is 32. Actress Camille Winbush (Secret Life of the American Teenager, The Bernie Mac Show) is 29. Vancouver-born actor Avan Jogia (Victorious, Twisted) is 27. Actor Jimmy Bennett (No Ordinary Family, Bosch) is 23. Actress Kelli Berglund (Lab Rats. Dolly Parton’s Christmas of Many Colors) is 23. Actor Evan Roe (Madam Secretary) is 19.